Yvon Chouinard, Patagonia's founder, got his start as a climber in 1953 as a 14-year-old member of the Southern California Falconry Club, which trained hawks and falcons for hunting. After one of the adult leaders, Don Prentice, taught the boys how to rappel down the cliffs to the falcon aeries, Yvon and his friends became so fond of the sport they started hopping freight trains to the west end of the San Fernando Valley, to the sandstone cliffs of Stoney Point. There, eventually, they learned to climb up as well as rappel down the rock. Chouinard started hanging out at Stoney Point on every weekend in the winter, and at Tahquitz Rock above Palm Springs in the fall and spring. There he met some other young climbers who belonged to the Sierra Club, including TM Herbert, Royal Robbins, and Tom Frost. Eventually, the friends moved on from Tahquitz to Yosemite, to teach themselves to climb its big walls. The only pitons available at that time were made of soft iron, placed once, then left in the rock. But in Yosemite, multiday ascents required hundreds of placements. Chouinard, after meeting John Salathé, a Swiss climber and Swedenborgian mystic who had once made hard-iron pitons out of Model A axles, decided to make his own reusable hardware. In 1957, he went to a junkyard and bought a used coal-fired forge, a 138-pound anvil, some tongs and hammers, and started teaching himself how to blacksmith. Chouinard made his first pitons from an old harvester blade and tried them out with T.M. Herbert on early ascents of the Lost Arrow Chimney and the North Face of Sentinel Rock in Yosemite. The word spread and soon friends had to have Chouinard's chrome-molybdenum steel pitons. Before he knew it he was in business. He could forge two of his in an hour, and sold them for $1.50 each. Chouinard built a small shop in his parents' backyard in Burbank. Most of his tools were portable, so he could load up his car and travel the California coast from Big Sur to San Diego, surfing. After a session, he would haul his anvil down to the beach and cut out angle pitons with a cold chisel and hammer before moving on. For the next few years, Chouinard forged pitons during the winter months, spent April to July on the walls of Yosemite, then headed out of the heat of summer for the high mountains of Wyoming, Canada, or the Alps, and then back to Yosemite in the fall until the snow fell in November. He supported himself selling gear from the back of his car. The profits were slim, though. For weeks at a time, he'd live on fifty cents to a dollar a day. Before leaving for the Rockies one summer he bought two cases of dented, canned cat tuna from a damaged-can outlet in San Francisco. This food supply was supplemented by oatmeal, potatoes, and poached ground squirrel and porcupines. In Yosemite, Chouinard and his friends were called the Valley Cong. They had to hide out from the rangers in the boulders above Camp 4 after they overstayed the 2-week camping limit. They took pride in the fact that climbing rocks and icefalls had no economic value, that they were rebels. Their heroes were Muir, Thoreau, Emerson, Gaston Rebuffat, Ricardo Cassin, and Herman Buhl. There was soon enough demand for Chouinard's gear that he couldn't keep making it by hand; he had to start using tools and dies and machinery. So in 1965, he went into partnership with Tom Frost, who was an aeronautical engineer as well as a climber, and had a keen sense of design and esthetics. During the nine years that Frost and Chouinard were partners, they redesigned and improved almost every climbing tool, to make them stronger, lighter, simpler, and more functional. They would return from every trip to the mountains with new ideas for improving existing tools. Have you ever thought, not only about the airplane but whatever man builds, that all of man's industrial efforts, all his computations and calculations, all the nights spent working over draughts and blueprints, invariably culminate in the production of a thing whose sole and guiding principle is the ultimate principle of simplicity? By 1970, Chouinard Equipment had become the largest supplier of climbing hardware in the U.S. It had also become an environmental villain because its gear was damaging the rock. Climbing had become more popular, but remained concentrated on the same well-tried routes in areas like El Dorado Canyon, the Shawangunks, and Yosemite Valley. The same fragile cracks had to endure repeated hammering of pitons, during both placement and removal and the disfiguring was severe. After an ascent of the degraded Nose route on El Capitan, which had been pristine a few summers earlier, Chouinard and Frost decided to phase out of the piton business. This was to be the first big environmental step we would take over the years. It was a huge business risk – pitons were then still the mainstay of the business – but it had to be done. Fortunately, there was an alternative: aluminum chocks that could be wedged by hand rather than hammered in and out of cracks. We introduced them in the first Chouinard Equipment catalog in 1972. There is a word for it, and the word is clean. Climbing with only nuts and runners for protection is clean climbing. Clean because the rock is left unaltered by the passing climber. Clean because nothing is hammered into the rock and then hammered back out, leaving the rock scarred and the next climber's experience less natural. Clean because the climber's protection leaves little trace of his ascension. Clean is climbing the rock without changing it; a step closer to organic climbing for the natural man. Within a few months of the catalog's mailing, the piton business had atrophied; chocks sold faster than they could be made. In the tin buildings of Chouinard Equipment, the steady pounding rhythm of the drop hammer gave way to the high-pitched, searing whine of the multiple-drill jig. During the late sixties, men did not wear bright, colorful clothes, not outside. 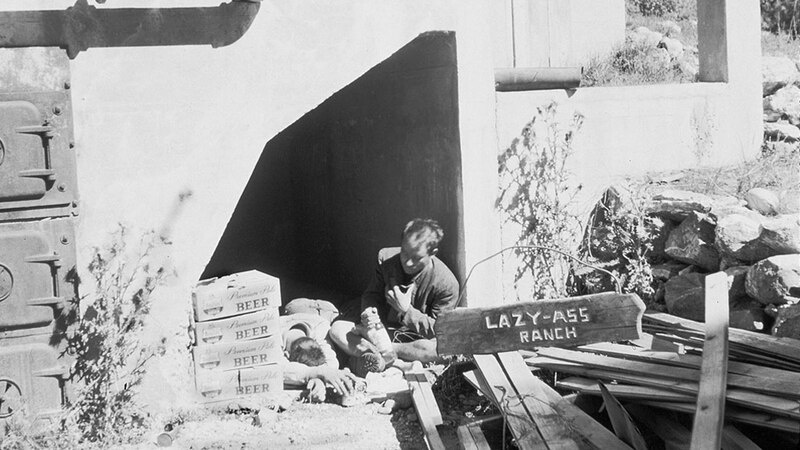 "Active sportswear" consisted of basic gray sweatshirts and pants, and the standard issue for climbing in Yosemite was tan cut-off chinos and white dress shirts bought from the thrift store. On a winter climbing trip to Scotland in 1970, Chouinard bought a regulation team rugby shirt to wear rock climbing. Overbuilt to withstand the rigors of rugby, it had a collar that would keep the hardware slings from cutting into the neck. It was blue, with two red and one yellow center stripe across the chest. Back in the States, Chouinard wore it around his climbing friends, who asked where they could get one. We ordered a few shirts from Umbro, in England, and they sold straight off. We couldn't keep them in stock, and soon began ordering shirts from New Zealand and Argentina as well. Other companies followed suit and we soon realized that we had introduced a minor fashion craze to the United States. We began to see clothing as a way to help support the marginally profitable hardware business, and by 1972 we were selling polyurethane rain cagoules and bivouac sacks from Scotland, boiled-wool gloves and mittens from Austria, and hand-knit reversible "schizo" hats from Boulder. As we began to make more and more clothes, we needed to find a name for our clothing line. Why not "Chouinard?" We already had a good image going, why start from scratch? We had two reasons against it. First, we didn't want to dilute the image of Chouinard as a tool company by making clothing under that label. And second, we didn't want our clothes to be associated only with mountain climbing. To most people, especially then, Patagonia was a name like Timbuktu or Shangri-La, far-off, interesting, not quite on the map. Patagonia brings to mind, as we once wrote in a catalog introduction, "romantic visions of glaciers tumbling into fjords, jagged windswept peaks, gauchos and condors." It's been a good name for us, and it can be pronounced in every language. At a time when the entire mountaineering community relied on the traditional, moisture-absorbing layers of cotton, wool, and down, we looked elsewhere for inspiration – and protection. We decided that a staple of North Atlantic fishermen, the synthetic pile sweater, would make an ideal mountain layer, because it would insulate well without absorbing moisture. But we needed to find some fabric to test out our idea, and it wasn't easy to find. Finally, Malinda Chouinard, acting on a hunch, drove to the Merchandise Mart in Los Angeles. She found what she was looking for at Malden Mills, freshly emerged from bankruptcy after the collapse of the fake fur-coat market. We sewed up samples and field-tested them in alpine conditions. It had a couple of drawbacks: a bulky, lumbering fit and a bad-hair-day look, thanks to fibers that quickly pilled. But it was astonishingly warm, particularly when used with a shell. It insulated when wet, but also dried in minutes, and it reduced the number of layers a climber had to wear. It does no good to wear a quick-drying insulation layer over cotton underwear, which absorbs body moisture, then freezes. So In 1980 we came out with insulating long underwear made of polypropylene, a synthetic fiber that has a very low specific gravity and absorbs no water. It had been used in the manufacture of industrial commodities like marine ropes, which float. Its first adaptation to clothing was as a non-woven lining in disposable diapers. Using the capabilities of this new underwear as the basis of a system, we became the first company to teach, through essays in our catalog, the concept of layering to the outdoor community. This approach involves wearing an inner layer against the skin for moisture transport, a middle layer of pile for insulation, and then an outer shell layer for wind and moisture protection. It didn't take many seasons before we saw much less cotton and wool in the mountains – and a lot of badly pilled powder blue and tan pile sweaters worn over striped polypropylene underwear. Polypropylene, like pile, had some problems. It had a very low melting temperature – and customers were melting their underwear in commercial dryers, which run hotter than home dryers. Also, polypropylene is hydrophobic and repels water, so it was difficult to get thoroughly clean; it retained odors. And its wicking properties were not inherent in the fabric but a product of oils applied in the process of spinning and knitting that, after twenty washings or so, would wear off. Although both pile and polypropylene were immediately successful, and we did not yet have significant competition, we worked hard from the start to improve our quality and overcome the problems by both fabrics. Improving pile was a gradual process. We worked closely with Malden to develop first a softer Bunting fabric, a synthetic boiled wool that pilled less, and eventually Synchilla®, an even softer, double-faced fabric that did not pill at all. With Synchilla, we learned an important lesson in business. While Malden's access to capital made many of the innovations possible, the fabric never would have been developed if we had not actively shaped the research and development process. From that point forward, we began to make significant investments in research & design. Our fabric lab and our fabric development department, in particular, became the envy of the industry. Mills were anxious to work with us on developing projects; they knew that if Patagonia were to push them or help them, the developed fabric would likely be a better one. But our replacement for polypropylene did not come from such a mutual development process with a mill; it came from out of the blue. In 1984, while walking around the Sporting Goods show in Chicago, Chouinard saw a demonstration of polyester football jerseys being cleaned of grass stains. Polyester, like polypropylene, is made from melted plastic resins extruded through a die to create a thin, thread-like fiber. These plastic fibers are very smooth; clothing woven from them is difficult to clean because the slick fibers repel the soap and water of normal washing. Milliken, the company that made the football jerseys, had developed a process that permanently etched the surface of the fiber as it was extruded, so that the surface became hydrophilic – water loving. It wicked moisture to the outside and the treatment was permanent. Chouinard saw the fabric as perfect for underwear. And polyester had a much higher melting temperature than polypro, so it wouldn't melt in a commercial dryer. In fall 1985 we shifted our entire line of polypropylene underwear to the new Capilene® polyester. It was a big risk, similar to our introduction of chocks in 1972. During the same season we also introduced the new Synchilla fleece: between them, the older products made of polypropylene and bunting had represented 70% of our sales. But our loyal core customers quickly realized the advantages of Capilene and Synchilla, and sales soared. During the early 1980s, we made another important shift. At a time when all outdoor products were either tan, forest green, or, at the most colorful, powder blue, we drenched the Patagonia line in vivid color. We introduced cobalt, teal, French red, aloe, seafoam, and iced mocha. Patagonia clothing, still rugged, moved beyond bland-looking to blasphemous. The runaway popularity of dramatic colors, and the growing appeal of technical fabrics like Synchilla, created a new concern. The Patagonia label had now become as much of a fad as the rugby shirt, and our popularity extended well beyond the outdoor community to fashion consumers. Although we devoted most of our selling efforts and catalog space to explaining the technical merits of layered clothing for hard-core enthusiasts, and had success with those products, the best-selling pieces were our least technical – Baggies beach shorts and shelled Synchilla bomber-style sports jackets. We began to grow at a rapid pace; at one point we made Inc. Magazine's list of the fastest-growing privately held companies. That rapid growth came to a halt in the summer of 1991, when our sales crimped during a recession and our bankers, themselves in trouble and up for sale, called in our revolving loan. To pay off the debt, we had to drastically cut costs and dump inventory. We laid off 20% of our work force–many of them friends and friends of friends. And we nearly lost our independence as a company. That taught us a major lesson. We have kept growth – and borrowing – to a modest scale ever since. We were able, in many ways, to keep alive our cultural values, even during the heavy-growth years, and after the shock of the 1991 layoffs. We were surrounded by friends who could dress however they wanted, even barefooted. People ran or surfed at lunch, or played volleyball in the sandpit at the back of the building. The company sponsored ski and climbing trips; many more trips were undertaken informally by groups of friends who would drive up to the Sierras on Friday night and arrive home, groggy but happy, in time for work on Monday morning. Since 1984 we have had no private offices, an architectural arrangement that sometimes creates distractions but also helps keep communication open. That year we opened a cafeteria where employees can gather throughout the day that to this day serves healthy, mostly vegetarian food. And we also opened, at Malinda Chouinard's insistence, an on-site child care center, at the time one of only 150 in the country (today there are more than 3,000). The presence of children playing in the yard, or having lunch with their parents in the cafeteria helps keep the company atmosphere more familial than corporate. We also continue to offer – mostly for the benefit of working parents but also for others – flexible working hours and job sharing. We have never had to make a "break" from the traditional corporate culture that makes businesses hidebound and inhibits creativity. For the most part, we simply made the effort to hold to our own values and traditions. Patagonia was still a fairly small company when we started to devote time and money to the increasingly apparent environmental crisis. We all saw what was happening in the remote corners of the world: creeping pollution and deforestation, the slow, then not so slow, disappearance of fish and wildlife. And we saw what was happening closer to home: thousand year-old Sequoias succumbing to L.A. smog, the thinning of life in tide pools and kelp beds, the rampant development of the land along the coast. What we began to read – about global warming, the cutting and burning of tropical forests, the rapid loss of groundwater and topsoil, acid rain, the ruin of rivers and creeks from silting-over dams – reinforced what we saw with our eyes and smelled with our noses during our travels. At the same time, we slowly became aware that uphill battles fought by small, dedicated groups of people to save patches of habitat could yield significant results. The first lesson had come right here at home, in the early '70s. A group of us went to a city council meeting to help protect a local surf break. We knew vaguely that the Ventura River had once been a major steelhead salmon habitat. Then, during the forties, two dams were built, and water diverted. Except for winter rains, the only water left at the river mouth flowed from the sewage plant. At that city council meeting, several experts testified that the river was dead and that channeling the mouth would have no effect on remaining bird- and wildlife, or on our surf break. Things looked grim until Mark Capelli, a 25-year-old biology student, gave a slide show of photos he had taken along the river – of the birds that lived in the willows, of the muskrats and water snakes, of eels that spawned in the estuary. He even showed a slide of a steelhead smolt: yes, fifty or so steelhead still came to spawn in our "dead" river. The development plan was defeated. We gave Mark office space and a mailbox, and small contributions to help him fight the River's battle. As more development plans cropped up, the Friends of the Ventura River worked to defeat them, to clean up the water and to increase its flow. Wildlife increased and more steelhead began to spawn. Mark taught us two important lessons: that a grassroots effort could make a difference, and that degraded habitat could, with effort, be restored. His work inspired us. We began to make regular donations, to stick to smaller groups working to save or restore habitat rather than give the money to NGOs with big staffs, overheads, and corporate connections. In 1986, we committed to donate 10% of profits each year to these groups. We later upped the ante to 1% of sales, or 10% of profits, whichever was greater. We have kept to that commitment every year since. In 1988, we initiated our first national environmental campaign on behalf of an alternative master plan to deurbanize the Yosemite Valley. Each year since, we have undertaken a major education campaign on an environmental issue. We took an early position against globalization of trade where it means compromise of environmental and labor standards. We have argued for dam removal where silting, marginally useful dams compromise fish life. We have supported wildlands projects that seek to preserve ecosystems whole and create corridors for wildlife to roam. We hold, every eighteen months, a "Tools for Activists" conference to teach marketing and publicity skills to some of the groups we work with. We also, early on, began initial steps to reduce our own role as a corporate polluter: we have been using recycled-content paper for our catalogs since the mid-eighties. We worked with Malden Mills to develop recycled polyester for use in our Synchilla fleece. Our distribution center in Reno, opened in 1996, achieved a 60% reduction in energy use through solar-tracking skylights and radiant heating; we used recycled content for everything from rebar to carpet to the partitions between urinals. We retrofitted lighting systems in existing stores, and build-outs for new stores became increasingly environmentally friendly. We assessed the dyes we used and eliminated colors from the line that required the use of toxic metals and sulfides. Most importantly, since the early nineties, we have made environmental responsibility a key element of everyone's job. When we commissioned from an independent research company an environmental impact assessment of four major fibers, we expected to learn that oil-based polyester and nylon were big energy consumers and sources of pollution. And so they proved to be, but not on the scale of cotton. The "natural" fiber used in most of our sportswear proved to be by far the greatest environmental evildoer of the fibers studied. We learned that 25% of all toxic pesticides used in agriculture was (and is) used in the cultivation of cotton, that the resulting pollution of soil and water was (and is) horrific, and that evidence of damage to the health of fieldworkers is strong, though difficult to prove. Cotton was the biggest villain – and it didn't have to be. Farmers had grown cotton organically, without pesticides, for thousands of years. Only after World War II did the chemicals originally developed as nerve gases become available for commercial use, to eliminate the need for weeding fields by hand. We experimented. At first we made only T-shirts with organic cotton. Then, after several trips to the San Joaquin Valley, after we smelled the selenium ponds and saw the lunar landscape of cotton fields, we asked a critical question: How could we continue to make products that laid waste to the earth this way? In the fall of 1994, we made the decision to take our cotton sportswear 100% organic by 1996. We had eighteen months to make the switch for 66 products – and only four months to line up the fabric. We found that there simply wasn't enough organic cotton commercially available to buy through brokers. We had to go direct to the few farmers who had gone back to organic methods. And then we had to go to the ginners and spinners and persuade them to clean their equipment after running what would be for them very low quantities. We had to talk to the certifiers so that all the fiber could be traced back to the bale. We succeeded. Every Patagonia garment made of cotton in 1996 was organic, and has been ever since. We continue the search for more environmentally friendly fabrics. We are using more hemp, in some products in combination with recycled polyester. Recently, one of our suppliers has found a way to recycle polyester from sources other than soda bottles – and we're making use of the fabric in some of our best selling products. More importantly, clothes themselves potentially can be recyclable. In the future, it should be possible for consumers to return a polyester-based jacket to us to then forward onto a processor to be re-made into fiber or other forms of plastic. Thirty years after the Patagonia label first appeared, we continue to make the best product. The pace of innovation during the most recent five-year period has been one of our most significant. We have developed body-mapped, or variable-knit Capilene® base layers that, through their thoughtful construction, wick moisture more efficiently and allow the wearer more freedom of movement. Regulator® insulation represents a significant technical improvement over Synchilla. It's lighter, warmer, wicks moisture more quickly and is far more compressible in a pack. And it works in concert with a remarkable new generation of shells – hard, soft, and hybrid – that are also lighter, stretchier, and more supple than any of their predecessors. Indeed fabrics have advanced so far – in the direction of St. Exupéry's functional minimalism – that construction methods long limited to the needle and thread must now catch up. For spring 2005, we are introducing new seaming methods for both soft and hard shells that reduce bulk, improve drape, and more significantly, improve performance in wet weather. During the past thirty years, we've made many mistakes but we've never lost our way for very long. Although we first intended Patagonia as a way to free ourselves from the limitations of the original climbing business, precisely those limitations have kept us on our toes and helped us thrive. We still pursue climbing and surfing, activities that entail risk, require soul, and invite reflection. We favor informal travels with friends – doing what we love to do – to the camera-covered event. We can't bring ourselves to knowingly make a mediocre product. And we cannot avert our eyes from the harm done, by all of us, to our one and only home. * Excerpts from WIND, SAND AND STARS, copyright 1939 by Antoine de Saint Exupery and renewed 1967 by Lewis Galantiere, reprinted by permission of Harcourt, Inc. This material may not be reproduced, stored in a retrieval system, or transmitted in any form without the prior written permission of the publisher. 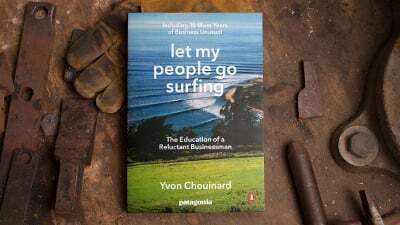 Revised and updated on the 10th anniversary of its original publication, Let My People Go Surfing is the story of an iconoclastic entrepreneur who brought doing good to the heart of his business. But even more so, it’s about challenging conventional wisdom, leading a simpler and more examined life, and making a living without losing your soul.